I finished up two more layouts for Paper Smooches Heart Challenge. 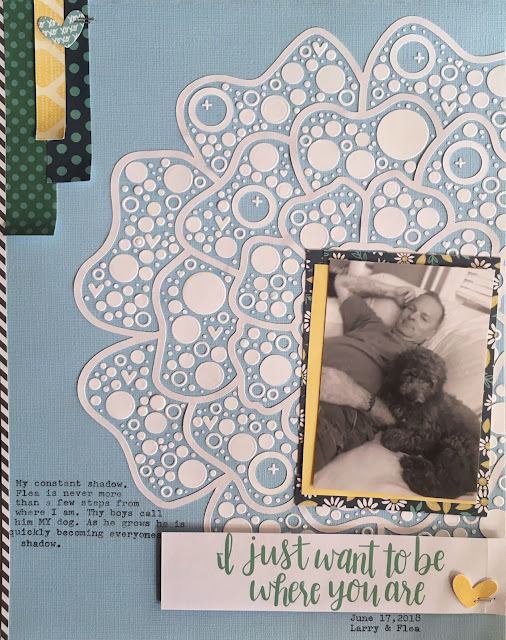 In the first layout I filled a cut file from Paige Evans Taylor with lots and LOTS of die cut circles, dots, and hearts. I used the heart from Paper Smooches Pawprint die. 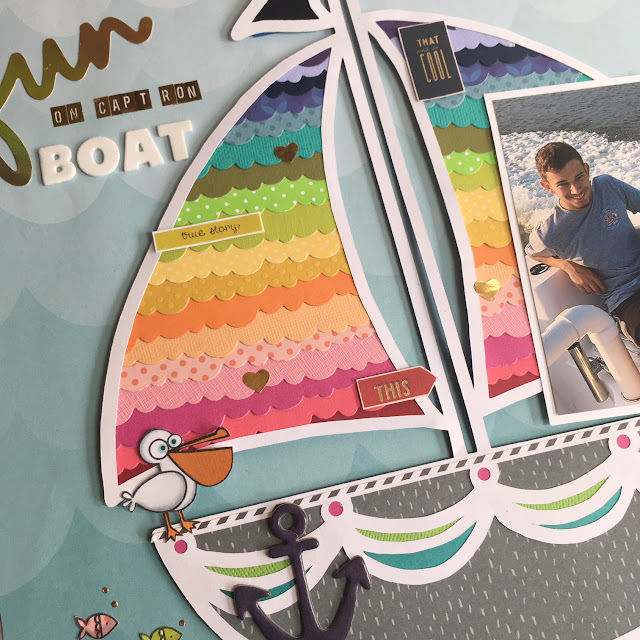 The circles are from Paper Smooches Ocean Scene die set. The X is from Paper Smooches Stitched Border die set. The sentiment is cut from a Paige Evans project life card and describes Flea perfectly. This little cutie is turning 1 this week! 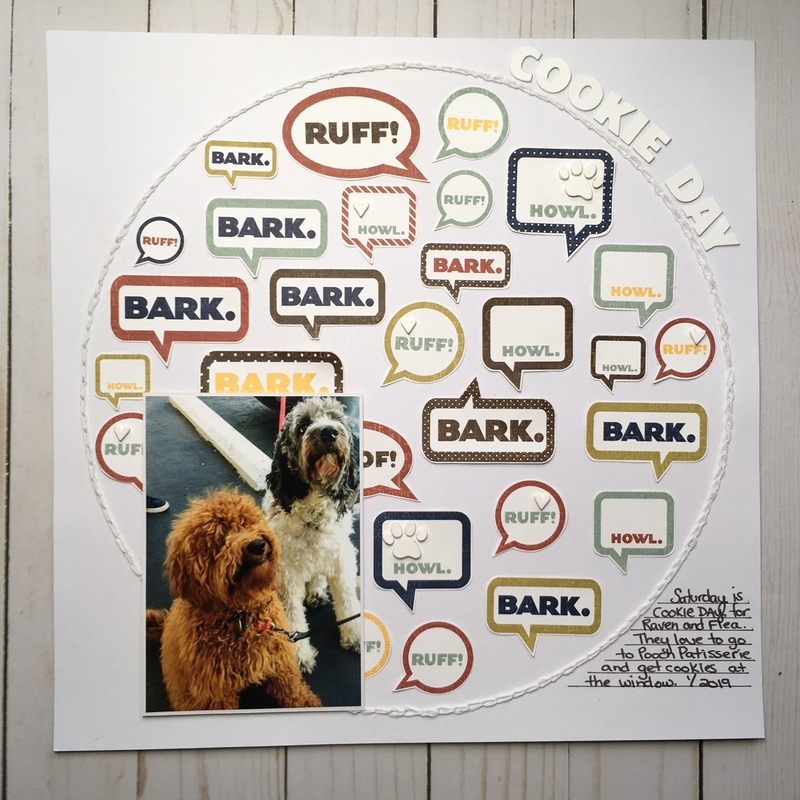 This next layout uses a cut file from Virginia Walker (Confessions Of a Paper Addict Facebook Group). 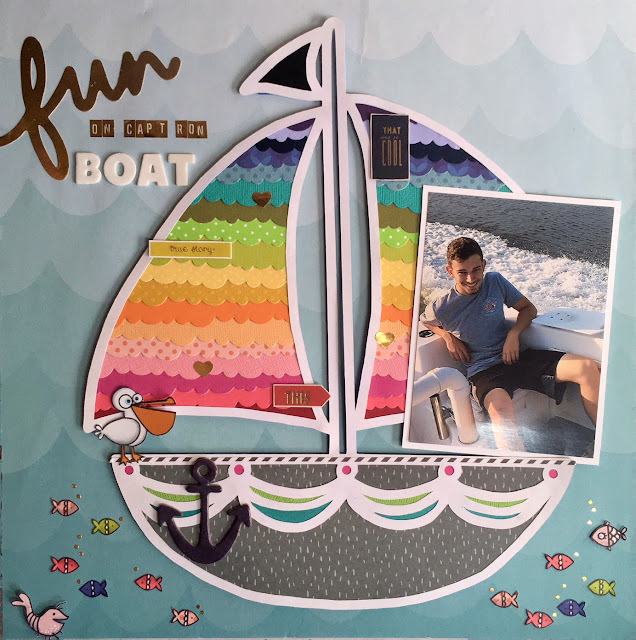 I backed the cut file with strips of paper cut using the Paper Smooches Borders 1 Die set. 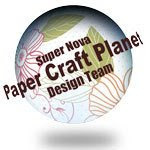 Such a fun way to used up scraps of cardstock and pattern paper. I embellished it with images stamped from the Paper Smooches Surf and Turf set. The gold hearts and alphas are from Maggie Holmes. The sentiment embellishments are cut from Paige Evans Pick Me Up 6 x 6 paper. 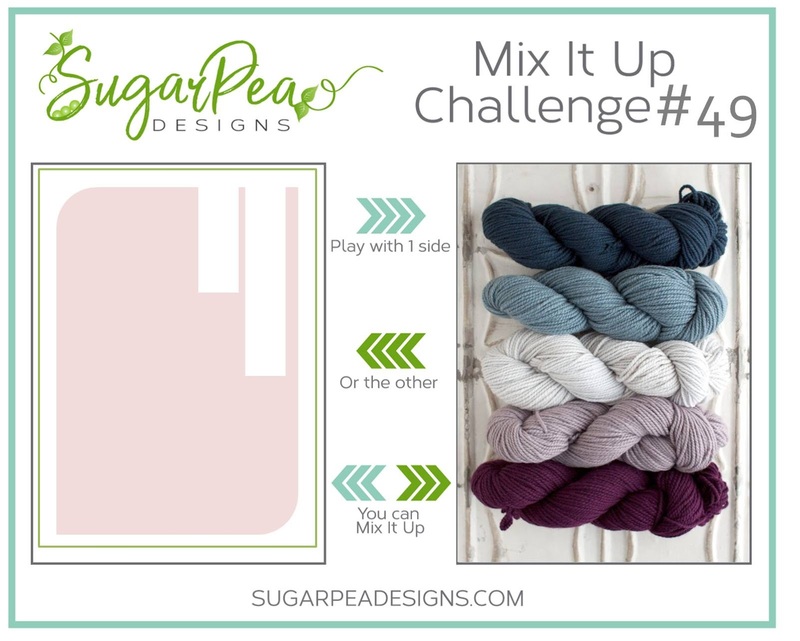 Playing along with this month's Paper Smooches challenge... HEARTS! I used the tiny heart and small pawprint from PS Pawprint Die. I cut the speech bubbles out of an old piece of Echo Park paper. This week I'm playing along with Stampendous for an Ugly Sweater Contest using the Cool Penguin Clear Stamp set and dies. Check out all the samples on the Stampendous Blog, and be sure to leave nice comments. At the end of this week you can vote for your favorite! Stampendous will draw three lucky winners with U.S. Mailing Addresses from those voting to win the Cool Penguin set. 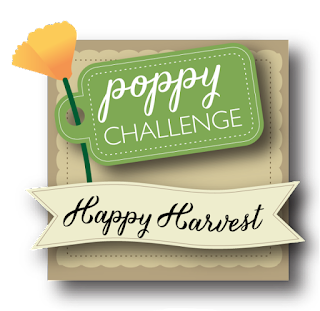 And the designer with the most votes will get $50 to spend on Stampendous Product!! Now onto my layout! I remembered I had a photo of my son from last year wearing his "ugly" sweater for work at McDonalds. With a bit of masking... ok, a LOT of masking I created the penguin pattern paper. I colored it in with colored pencils. One two of the sweaters I added a "M" for McDonalds. 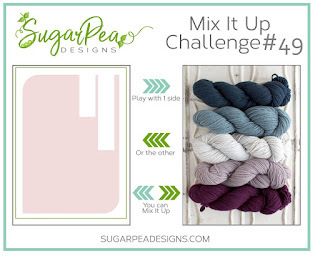 Today I'm playing along with this month's Sugar Pea sketch challenge. I love this guy from Sugar Pea's Timber stamp set and think he makes a pretty cute rustic Santa! Playing along with Poppy Stamps November Challenge... Happy Harvest. 1. Paint DIY Bangles Wreath blank black. Allow to dry. 2. Add spiderwebs with Black Embossing Paste and the Spiderweb stencil. Allow to dry. 3. Rub Deco Arts Metallic Lustre over the wreath. 4. Back wreath with Pebbles pattern paper. 5. Embellish with Pebbles Thickers and Wall Bats. Join the fun! 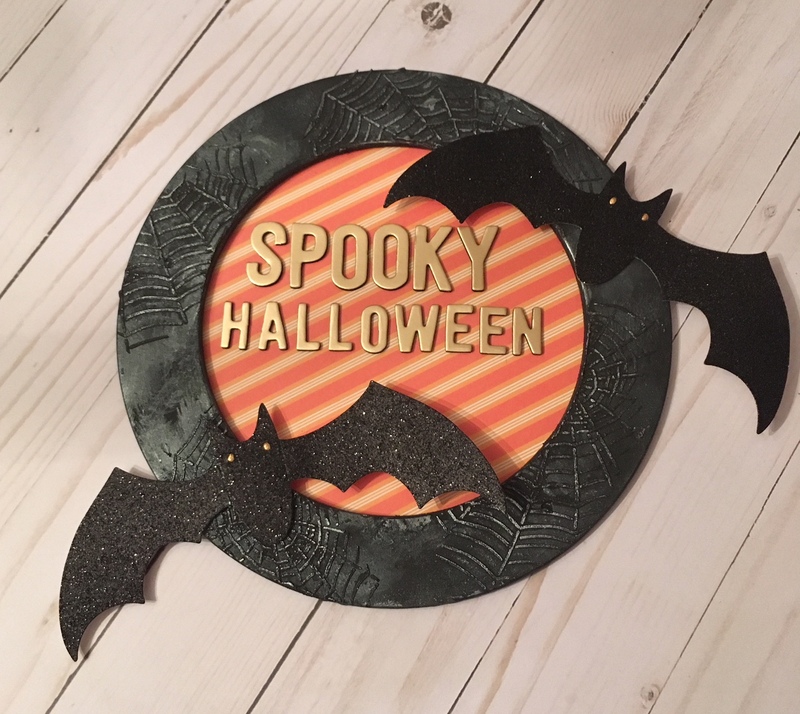 Make a Halloween project (card, treat, home decor…) to enter the challenge. Post your image online on your blog, instagram, pinterest or other feed to grab the link. Nowhere to post? 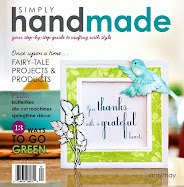 Email it to Stampendous at submissions@stampendous.com and they'll host it for you. 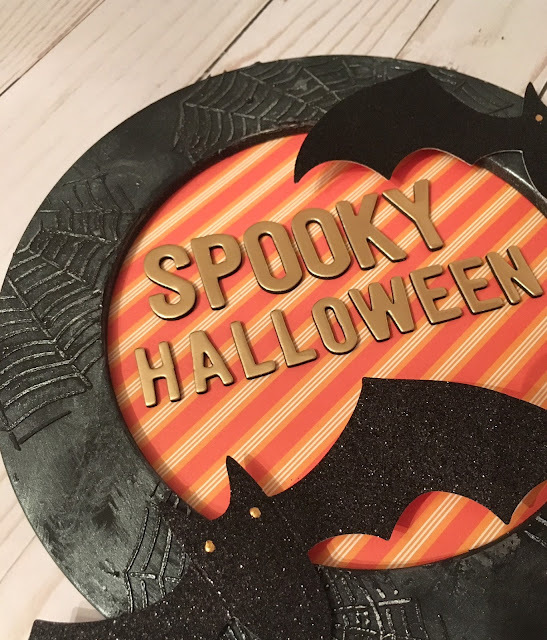 Stampendous will draw winners weekly for great Halloween prizes. Enter early and as often as you like. Our Official Contest Rules are HERE. A couple limitations! You must have a U.S. Mailing address to win, although you can share your creations without one. Your projects must be family-friendly or they’ll be removed. Welcome back for day 22 of Stampendous the 31 Days of Halloween! 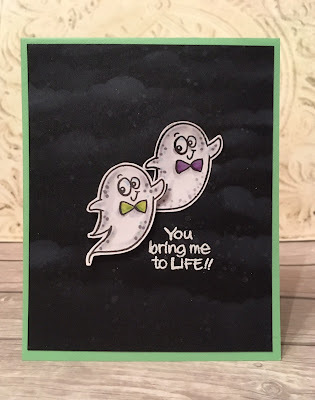 Today I'm sharing a card I created with the adorable Bring To Life Clear Stamp Set. WANT TO KNOW WHEN I HAVE NEW POSTS?